Yesterday’s NBA matchup between the Detroit Pistons and the Washington Wizards was meaningless for most of the country. The Pistons are out of playoff contention and have been unloading their bench in recent games. The Wizards already locked up their playoff spot and their best player, John Wall, didn’t even dress for the contest. Yet the game was still on TNT, and was treated like any other regular season game. But it wasn’t any other regular season game for Pistons fans. Last night was the last game at The Palace of Auburn Hills, as the team will be moving downtown to Little Caesars Arena next season. The night was filled with memories, reunions and tributes, former fan favorites returning to the stadium they used to call home, but you wouldn’t know it by watching on tv. TNT did a horrible job of showing these ceremonies or even discussing the building much at all. It’s a travesty that this was a national game, and the local fans got ripped off. Kevin Harlan is one of my favorite basketball broadcasters, but he could only do so much. At one point, he mentioned how the city of Detroit was on the banks of Lake Michigan. Chris Webber, a Detroit native, was even more disappointing. If anyone on the broadcast could have told stories about the team or the building on its last night, it should have been Webber. But he stumbled along the broadcast with Harlan. It was awkward, disappointing and frustrating all at the same time. I get it, most of the national audience doesn’t really care about the Palace, so focusing heavily on it would have probably alienated many of the viewers. That’s why Fox Sports Detroit, and more specifically legendary Pistons broadcaster George Blaha, should have been on the call. Blaha and FSD have done a tremendous job covering the “Best of Seven” series that the Pistons have been running this season, with halftime ceremonies during games against teams that have a historical connection to the Pistons. Blaha has been the host of all these ceremonies and made them a treat to watch for Pistons fans at home. Not to mention his knowledge of the history of the organization and his passion for the team is second to none. He and Greg Kelser would have made the game so much more fun and so much more meaningful to Pistons fans. What were fans treated to last night? A 20-second montage of former players walking onto the court and bland interviews of Isiah Thomas and Chauncey Billups. TNT mailed it in and disrespected the Palace, the Pistons and their fans. Just look at the tremendous job FSD did for Joe Louis Arena’s last game. Extensive pregame coverage, interviews with former players and that incredible postgame ceremony that fans could watch in its entirety, not a 20-second montage. As a Pistons fan, this was supposed to be one of the most meaningful games of the season, regardless of the win-loss record of the team. I had been looking forward to watching this game ever since the Pistons announced they were headed to Detroit. 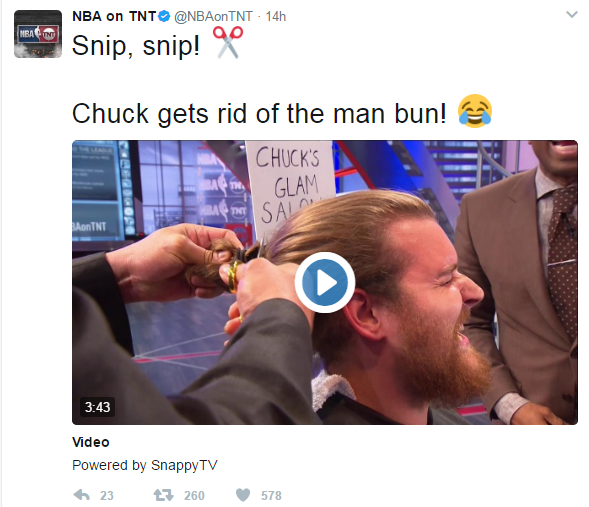 But TNT took it away, trampled all over it and left Barkley to laugh at us.